Thank you so much!!! You all have been great to do business with!! And yes, hopefully no one else wants to beat up my box this time! LOL!! Barb, Thank you for all of your help! You were so great at giving me tips for using the site and getting the right books I’ll be in Touch when I get the rest of the order together. Have a great week- you made my week so much simpler! Sincerely , Jean Kerrigan. Thank you so much for your kindness and the professional way you handled this mix-up. I showed your site to both of my classes today and plan on many future purchases. Thank you, Frank, for all of your help!! I could not have pulled this off without your assistance and your quick turn around on send the books Washington ordered. We really appreciate you and your effort!! Thank you so much for checking. I plan on using Stargirl in the library, and that's why I ordered the library bound. I really appreciate you asking, though. That is wonderful customer service! Have a great day! Thank you again for making it possible to hand out books at our fall festival. It was a success! Have a great week! We have our meeting on the 27th where we will officially decide on our book title, and from there we can place the order. The 20 copies of the Sharing Books Talking Science are in my office. I am overwhelmed by your service. These materials will be disseminated to teachers next week, and positively impacting students within days. Thank you all so much for always supplying our needs at FES! Our Book Fair is going great! Everyone loves it! You did a wonderful job picking out the books. They are exactly what we needed and it was like Christmas morning opening that box, I was SO excited! Thanks again for all of your help. I hope we can do business again soon! Our students loved getting the Summer Reading books. They were pulling the books out and reading them immediately! With the books we had left over we stocked our newly constructed Little Free Libraries. Our students and fathers helped build and paint these libraries. There are 6 of these around the town of Liberty. Thank you for all that you do to encourage children to read. I just wanted to let you know that I just placed another large order for Ruston High School in Ruston, Louisiana. The PO is attached. I always go with your company because your prices are the lowest, and your service is the best. I will take the no cost replacements – thanks! Do I need to send back the ones I have? Thank you so much for you help and patience with placing this order. It has TRULY been a pleasure working with you. You have been very receptive to our needs. Thank you again. Attached please find a list of the site locations along with a student count at each site. If you need any additional information, please feel free to give me a call. Thank you so much! Lynne and I were just talking about how much we enjoyed ordering from your company! All the information we needed was on your website, from Purchase Order information, to the W-9 form etc. We wish all companies were set up this way. It sure makes ordering a pleasure! THANK YOU SOOOOOOO MUCH!!!!!!!!!!!!!!!!!! The books arrived late yesterday and they are in perfect condition!!!!!! Both Program Director and Department Chair are VERY happy which makes my day!!!!! I WISH you all were able to order the final book as I am having an EXTREMELY hard time with finding and ordering the book and now hoping and PRAYING to have it by the time the residents start in the summer. I can’t THANK YOU enough for all of your help and assistance!!!!! I hope you have a wonderful rest of your week Frank!!!!! Barb, Thank you again! Your company's Customer Service is BY FAR the BEST! Patti is always a pleasure to talk with, both you and Patti are quick to respond and ALWAYS makes things MUCH, MUCH easier than I imagine they will be! My expectations have been EXCEEDED every time I have worked with your company!!! Again, thank you so much! You are a beautiful person and I hope your day is really great! I appreciate your help and I've got to say, your company has really good customer service. I wanted to write a quick thank you to your company. It is the first time I have ordered through Reading Warehouse and I am always a little nervous when trying a new vendor. Imagine how pleased I was to receive my materials so quickly and in perfect condition! I will be recommending you to fellow librarians. Barb, Thanks for checking in such a timely manner. This is my first time using your company and I will definitely use you again. I will pass the extra books along to a colleague and will recommend your company. You are the best, and you just made my Friday, for more reasons than one. It's been a pleasure working with you as well, and I really appreciate the good news. Thanks so much for all the personal attention and I will definitely use your services again. When a situation like this arises, knowing that a company with wonderful employees bending over backward to fix the problem, make a person want to do business with them again!! Thanks!!!! I want to say thank you for getting all the books to us by Friday. We launched our reading month with a pep rally on Friday and then the students returned to class and picked their book to read. We could not have done this if the books weren’t here. I can’t thank you enough. You have also started our set of eight books for next year with the arrival of Freedom Stone. I’ll definitely spread the word on the Reading Warehouse in our area. Just wanted to thank you for the excellent service. Our order was delivered today! It will be an exciting event for the parents and students. I just wanted to let you know that author J.E. Thompson spoke at our literacy night and was FABULOUS! He is a great guy and he did an outstanding job. Thank you so much for putting me in contact with him. I will gladly provide a reference for him if any other schools should need it. THANKS!!!! Her Email to us was she needed help finding the Mad Libs Special. I received the calendars today, thank you soooo much for your generosity. We will definitely put all the wonderful items to good use. When we talked at the Symposium for First Year Teachers and I asked about books for the Induction Teachers in my district, I was pleased to hear you would ship some materials to me. What a grand surprise when THREE boxes arrived!! I am most grateful of the variety of books and the canvas totes you sent me to share with the Induction Teachers in Spartanburg School District 7. This provided a good start on the libraries they will create in each of their classrooms. Your support of our teachers is appreciated. Hello, used my end of year supply money to buy more bargain boxes. I was very impressed with the selection and it will be a wonderful addition to my classroom library. Thank you so much for the invoice. You made it so easy. It is a pleasure working with vendors and reps like you. Hopefully, we will do business again in the future. Have a wonderful summer. Thank you so much. I am really excited for the students at Jefferson Elementary. The principal, Ms. Wallace, understands that there will be 2 shipments. Thank you so much and please let your staff know that we appreciate the effort that it took to get this task completed in such a short amount of time. This is fabulous. I appreciate all the help and support Jeff and Frank gave us to get these books here on time. It looks like we will make our Saturday deadline (no worries if we don't - we have a back up plan). Three cheers for the Reading Warehouse! The books are wonderful! Thank you so much going above and beyond! Our teachers and students appreciate it and so do I. I will remember to use the comment box next yearJ Thanks again!!! I'm not sure if you personally handle matters like this, but I wanted to let Reading Warehouse know that my colleagues and I at Big Elm Elementary in WV are so pleased with our recent order. We received everything we wanted and MORE and are all so impressed with the quality of the materials. The personnel at Reading Warehouse has been friendly and cooperative throughout and I couldn't be happier. I will definitely be making future purchases with Reading Warehouse. Hi! I apologize for not writing this sooner. Just wanted to let you know that I did indeed receive my book order before the students left for Christmas break. The selection was excellent and I was especially pleased that there were multiple copies of the same titles. It will make for great book discussions! Again thank you for your willingness to accommodate on such short notice! Hope your new year is off to a grand start! OMGosh! Ms. Wood, our school librarian, just sent me a copy of the correspondence between the two of you regarding "Grow Your Heart Three Sizes Promotional Materials." THANK YOU so much for your shared love of reading and your willingness to help us foster the love of reading with our students. I love that big, wonderful book you sent in the kit (How the Grinch Stole Christmas). I can't wait for our kids to be involved in yet another school wide literacy initiative. You and The Reading Warehouse rock!!! OMIGOODNESS!!! Thank you SO MUCH! I am so excited about implementing this fun program. We have an all-out reading initiative at our school this year, and this promotion will help make Christmas-tide about reading as well as about it's true meaning. I really appreciate your personal attention, and you will get pictures!! Merry Grinch-mas! I cannot tell you how happy I have been with you guys. Your customer service has gone above and beyond for us! I REALLY appreciate it! My teachers will be SO happy, and I'll be placing the next order with at least a month leeway so you won't have to work so hard! I did receive the books and they are exactly what we needed! Thank you again for working with and being so flexible with what we needed. I look forward to working with you again in the future! The books arrived yesterday and I started cataloging right away. Thank you for helping us secure the books at such a great price. I am pleased and impressed with the speed in which your company filled my order. I was also impressed that I was able to get all the discount books I ordered except one. Job well done on your part! As soon as I get more money for library purchases I will again place an order with the Reading Warehouse. Thank you for providing quality books at prices we can afford in this economy!!!!! Again, Thank-you. I am one very happy/satisfied customer!!!! What a surprise to be the recipient of the weekly book giveaway! My eleventh grade Reading Seminar students have so many new books from which to choose. We appreciate your incredible generosity. I just wanted to say that I received the books that I won, in the book giveaway, in the mail today. I just wanted to say thank you so much for these books. I know that my students will enjoy them very much. Thank you again. I recently received an unexpected box here at my school and was absolutely overjoyed when I opened it to find I was a winner of one of your weekly book giveaways! Many of my ninth graders (several are struggling readers) are already reading one of the books. Some have even latched on to the SAT vocabulary flashcards you included. The books I've received from you have really been a great addition to my classroom library. Thanks so much. Thank-you so much for the $500.00 of free books! Everyone is so excited! The staff and students love the books. I have been ordering from you for the last few years and I have always been pleased with your service and the quality of your books. Thanks again Reading Warehouse your awesome! I received the books today and I am thrilled! What a great selection of books for teens plus a few for grown-ups, too! Thank you so much and thank you to the publishers who participated in this contest. I am also hoping to get a virtual book fair organized as soon as I can get that together. I teach 5 classes, sponsor the yearbook and run the media center, so it may be awhile. Thanks again! I left you a message last night. Did you receive it? Thank you so much for the quick response to my email. I am impressed with your customer service. Honestly, I didn't expect to hear back from anyone. My school system is in session through Wednesday, so I would appreciate if you could send me replacement books for those that I can't give as gifts. It really is only about 8 or so. THANK YOU for the free box of books I won for Yulee Middle School! I was so surprised to walk into my room and see a huge box on my desk. The box had Dora Playkit on the side so I was puzzled knowing that I had not ordered anything relating to Dora. But my name was on the label so I opened to see what was in it. I had a letter informing me that I was a winner of this box of books from The Reading Warehouse. I had signed up at the first of the year. The box contained a great variety of books one of which I had been meaning to read for at least a year. I stocked my classroom library with new books and shared some of the books with my fellow teachers along with your website information. Thank you, again! Keep up the good work in making books affordable for the classrooms across the country. I look forward to your next promotion! my box! My kids and teachers will put all the goodies to good use. The Reading Warehouse Rocks! What service and I didn't even offer lasagna-- :) I ordered a Library Processing order on Friday and received the entire order the following Thursday. Thank you, thank you, thank you! THANK YOU for your AWESOME customer service. I really appreciate it. I will never hesitate to do business with your company again. I will also recommend this website to my fellow teachers. Dear Jeff and Frank, Many thanks for creating a book fair that was simply as easy as: ordering fiction and nonfiction book amounts and delivery on my desired dates, creating uncomplicated displays by unpacking boxes, my being able to set a price that the children at my poor rural school could afford, trouble-free counting and packing up the few unsold books for UPS pick up, and an uncomplicated book fair close out through your website. My primary school of 580 students is located in a poor, rural area. It was a joy to see our students excitedly choose a $3 dollar paperback or $5 hardback fiction or nonfiction book to add to their own book collection. Teachers and I were ecstatic at the fantastic book selection that included numerous Caldecotts, classic favorites, popular authors, and a wide variety of nonfiction books on popular children subjects at different text levels. A phone call to Jeff or Frank answered all of my questions as they provided excellent customer service. As a reward to our teachers, I used an idea similar to a teacher wish list that would expand our teachers’ classroom libraries by sending home the following note home to our parents. The response was a tremendous success as children with or without their teacher independently chose a great book to add to their classroom. Teachers bragged about several of the student notes to them that had been written on the inside cover. What a great memory for a teacher to read, enjoy, and treasure. My book fair was held for six days, $3370 was collected, and I made a $1000 dollar profit to add new resources to the library. This was fantastic, especially these days when our library dollars are getting harder and harder to receive. Jeff and Frank, thank you once again for sharing the joy of reading with our students and planting seeds to promote literacy. Wow! Thank you! I ordered my books (32) yesterday and received them this morning! I’ve been singing your praises to everyone today! Thank you for your prompt, efficient service! I wanted to thank you for your prompt response to my email. We have been out of school the past two days due to snow. As a result, I haven't been able to get the packing slip to pass the ISBN along yet. I will get it when we return (I would guess Monday). Also, I wanted to tell you that your company has been the most reliable with the best service that we've ordered books from thus far. So, no worries about the missing one. I will get you the packing info as soon as possible. Thank you for your prompt reply. I have received my order and am so THRILLED! The books all seem wonderful and arrived in mint condition. I am sure that my students will be thrilled to receive them! Again, thank you for offering such great books and service! Thank you for the very quick reply. I did not expect to hear back from someone on a Sunday. I noticed your quote from Emerson at the bottom of this message. If that is your motto, you are indeed living up to it! Thanks for checking. That is a true indication of the pride you spoke of! One of your great customer service representatives called me immediately after my email and I placed the order at that time. I was able to edit my addresses so it appears to be working for me now! I will be a returning customer! Thank you for the big box of books to jump-start our class library. My student’s thank you for the wonderful adventure they will enjoy while reading the books you donated. I received them today! Thanks again! They are great! We will have some happy children tomorrow! This is a fabulous resource. I will send the link to all the other music teachers in our school district. Your website is very easy to use. I easily found a pocket dictionary and have saved the site in favorites. My only concern is how to decide what to buy first. Thank you very much. You and your company are the best!! Thank you. I'll be looking out for them and will let you know when they arrive. I am so happy with the books from Reading Warehouse. We can order so many more because of the great prices. First, allow me to apologize for taking so long to write this note of thanks. I have been in training and meeting for the last two weeks. A million thanks go out to your company and Karla for taking the time to send Karla to Palm Beach Lakes High to help sort books into genres. Karla even told me if I need assistance during the summer or any other time to let her know and she will be glad to assist me. I, nor has any other reading coach, never ever heard of a book company coming to a school center to help sort books. I have put the word out that not only are you the best in price but number one in customer satisfaction. I will continue to order from your company. I have passed the word to other teachers, coaches and media specialist. Thank you so much for your quick response to my request! I will watch for the books in August. I LOVE the Reading Warehouse and have purchased many books from you. I didn't know you existed until last year and since then I have been spreading the word to everyone I know. It is without a doubt the BEST place for teachers to buy reasonably priced books for their classrooms. To The Reading Warehouse, I wanted to thank you for quickly filling and delivering our book order. Thank you so much! You have such wonderful customer service. Every time another librarian asks me where is a good place to buy books I always say The Reading Warehouse. Thanks so much for all you have done. Thanks for the free shipping. I will definitely use The Reading Warehouse for more book orders. Your prices are too good not to. Thanks again for all your help. Thank you so much for your quick response. I did receive our fax. Excellent communication. Thank you for looking into this. Dealing with your company has been very easy, I love how I can easily print an estimate to be turned in for purchase orders to be generated. In every time I have called and talked to your staff they have been very helpful and informative. Even the one time I called in the morning and called back later in the morning the person remembered me from the previous call. Thanks for the school friendly service you are providing. This is what I love about TRW instant service! Thanks look forward to talking with you on Monday. I just want to thank whoever for sending me an email telling me about your great company. I placed an order last Friday and was opening my box of books on Wednesday. Your prices are absolutely unbelievable. I love my books. A million thanks. I will share your site with my co-workers and friends. Thanks so much! I actually got the order at school Friday. I appreciate all your help and look forward to doing business with you in the future. This is Jana Radtke, the owner of Primrose School of Cross Creek and Primrose School of Tampa Palms. I forwarded a copy of your letter to Ms. Valentin (she is our Assistant Director at the Cross Creek School and is wonderful to work with). I just wanted to let you know that I found your site, and was thrilled, and place the $900+ order for the Primrose School of Tampa Palms. I passed your website information along to all Primrose Schools in Florida. Your service has been wonderful so far - we received the books in "record time". You have been very attentive to my order. I totally enjoyed all the books you sent. In fact one of the books, my granddaughter will like when she gets a little bit older. Thanks for taking care of everything for me, and following through so well! Whenever I send in another order, you are the person I would want to deal with. Thanks again for all your help. You take care of your customers well!!!! Hats off to you! What great service! You are awesome!!! Thank you for being so helpful,kind and efficient. Have a great holiday and good health and happiness to you for the new year!! Thank you for your email. The book arrived as ordered and very fast. Thank you for your wonderful service. I have recommended your site to all the teachers at our school. I received the shipment 2 days ago and the books look great. Thank you so much for taking care of this in such a timely manner. I am very impressed with your customer service, dealing with a human being and not a generic computer message has been extraordinary! Thanks again for taking the time to follow-up. Thanks so much for the prompt and personal reply! I don't mind the backorder at all.....it's supposedly Christmas music, so we're not quite there yet. I just wanted to make sure that it hadn't fallen through the cracks. Thanks again, and I'll look forward to receiving these items when they are available. Thank you for your speedy response. I love the free shipping. the teachers at my school as well as my friends. The following was posted on a Homeschooling Site in the State of Pennsylvania. The Reading Warehouse is a HUGE online bookstore that is exceptionally well-organized, with clear categories and sub-categories, and many ways to search for titles and authors and topics of interest. Many homeschoolers really appreciate their regular 30% discount on most books, and their shipping fees are very reasonable. This site does NOT carry any textbooks, but is filled with books for children and adults on all topics that will round out your homeschooling curriculum with 'real books'. And a company representative let me know that they carefully screen out any 'x-rated' titles, so you can feel comfortable searching on the site. A wide range of books on religious topics are on the site, including hundred and hundreds of books from the Christian and Jewish traditions. Lots for everyone! What was I thinking, buying copies of my book from my publisher?! If I order them from the Reading Warehouse, I can get 'em for $0.75 cheaper! I am excited to find your website. I am an avid reader and love having books in my classroom for my students. You have a wonderful collection of books at a wonderful price. I have and will share your site with others. I look forward to ordering more books in the future. I received my shipment of books. Thanks so much for all the extra goodies. My five year old really enjoyed the Stuart Little book. The pencils will make great prizes for my reading book club. It is nice to order from a company where I am treated so nicely. Thanks for the QUICK responses from you and your webmaster. I appreciate your answer. I forwarded your site to our librarian and will forward to our resource teachers. I will be purchasing some items when I start shopping with my discretionary funds. Thank you for letting me know what happened and taking care of the situation. I really appreciate it and look forward to shopping with you again! Thank you for the awesome packing job! Our books arrived and we were able to easily check them in and ship them out to schools. We really appreciate your efforts to clearly label everything and, to the extent possible, to pack class sets together. ordering books online. Thanks again for all your help. The Reading Warehouse is a great boon to money strapped teachers trying to build a classroom library. Thank you so much for your courtesy and attention. Thanks for the extra mouse pads and books!! They are great!! I just made a personal order of some of the books that were included in the New Voices! Thanks for throwing that in! Wow...thanks for the prompt and generous response. I will keep The Reading Warehouse in mind as I will be teaching more nursing courses in the future. I also appreciate your efforts regarding the misleading information in advertising the Mosby DVD. Have a fun 4th of July! Thank you Frank. I appreciate your responding back. Thank you also for the extra books. It was not necessary although I must say I look forward to receiving all my books. Any teacher loves getting books for their class. I will have another order to send soon. That is good customer service, well appreciated. Thank you so much for getting back to me. It is nice to hear from a real person when contacting a company about a concern. I am afraid that I will need the book sooner than it will come in. I will need to go to the University store and purchase it tomorrow before class. Thank you for explaining the situation to me. Again, I love this company, and now I love the customer service aspect of it also. I just ordered 105 copies of Maniac Magee by Jerry Spinelli. Now I'm wondering if you have all those copies in stock? I'm hoping to receive the order by Wednesday, March 26th. Please let me know if this is possible! Your website was great, by the way. Let me get this straight we are suppose to actually carry the books we advertise and you want them quickly, that is your question? We love taking care of our customers and it made my day to see that you liked our site. If I can ever help or you just need someone to give you a hard time please call or email anytime. Wow! Now, that's customer service! With replies like that, you can be sure I will always shop reading warehouse first. Especially when I need someone to give me a hard time! Note: Patti got all 105 books in two shipping days. Thank you again for your assistance and congeniality! Good old-fashioned service is a precious commodity, and I had to share that with my family and friends. One of them already wrote back saying I saved her a stressful trip to Barnes and Noble... she has 3 little kids. Another lives in the way mountains, so she was elated. Thank you for you help and attention. Friday will work for me so everything is fine and on schedule. Again thanks for the help. On behalf of the teachers of Berkeley County, I would like to thank you for your participation in the 2008 Instructional Fair. Your presence helped to make the Instructional Fair a complete success. We have heard many positive comments about your company, your display and your professionalism. Again thank you for sharing your company and products with us. We hope to see again at the next Instructional Fair in 2010. Berkeley Cty School District S.C.
You're a gentleman! Thank you so much for walking me through this first order. I wasn't lying when I said I'll shop with you forever! Goose Creek High School S.C. Thanks for letting me know about the shipping and helping out on this. Frankly, we tried to get the copies of the book from the other web-based book distributors...in addition to not having the books in stock somewhere, which you guys did have, it is also nice to be able to deal with people who can help you out. Just getting a phone number for amazon.com is an ordeal. I really appreciate the service you guys are providing. Thank you so much for your amazing customer service! I will certainly tell everyone I know where to find the best prices on books! Thanks so much for all your effort. You have definitely gone above and beyond for us. I will contact the publisher and see what rate they will charge us and if it is too expensive, we will come up with a plan B. I appreciate the heads up as quickly as you could so that we could be prepared. I will definitely recommend your company to others, though. You are great! I can’t believe that I received my order today! What fabulous service and great product. Please email an invoice so that I can get this paid in a timely fashion. Thanks so much! We look forward to placing our next order soon. Thanks for the speed of delivery. I adore doing business with you and The Reading Warehouse. If only every company’s customer service was as prompt and courteous as you, it would be a wonderful thing. You don’t know how much I appreciate your taking time to notify me about the order and then give an update. It restores my faith in retail. I feel your frustration with the publisher and know you’ve done everything you could to expedite the order. Whenever you get it and send it will be fine. Thanks again for you attention to the matter. We have much to be thankful for and appreciate this special day to thank God for His blessings. I really appreciate this kind of customer support. It's SO rare these days. I will definitely use your company again! One of the most scientifically accurate children’s fiction I have found and the only account of skink natural history I have ever found combined with a charming story of how Little skink loses his tail (as we all know truly happens) when attacked by a crow. He then wonders through the forest and studies the tails of other forest creatures while examining what special adaptations and features each tail offers to defend or assist that creature (Owl silent feathers; skunk smell; etc.). Soon he realizes his own tail has regenerated (as truly happens- I LOVE this book) and he is happy to be himself again. A must have title for all of our Herp programs! This book just came out on August 10th – go order your copy from The Reading Warehouse - you will love them. The Reading Warehouse (www.thereadingwarehouse.com) is your answer. The question is: Where is a great site to find books quickly and inexpensively? --Looking for graduation presents for any age person? --Looking for the titles on that pesky summer reading list? --Looking for books by grade or Lexile level? Not all book Web sites are created equal. The Reading Warehouse has several features that set it apart. With 6 million titles, 10 million by the end of summer, you are highly likely to find what you want. If a publisher happens to be out of a book, Reading Warehouse will tell you that rather than automatically put your request on back-order. Also, if you don't like to type your credit card number online, you can place your order and then phone in your method of payment. Prices are 30 percent (or more) off every day. Time-honored (or excoriated, depending on your point of view) titles such as "To Kill a Mockingbird" ($4.82) and "Animal Farm" ($5.49) are right there at the mouse click. 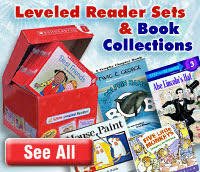 For parents who wish they'd never heard of Accelerated Reading levels and Lexile levels, this site eliminates those headaches by automatically translating the levels into titles. This site speaks the language of schools. You can even search for books by Accelerated Reading levels, Accelerated Reading quiz numbers and Lexile levels. You also can search by the usual keyword, author, title and subject. For those of you who are anticipating August, school supplies also are available. "Reading Rewards" is the Reading Warehouse program that gives 1 percent of purchases back to participating schools and nonprofit organizations. Spread the word. This could be a no-sweat fundraiser for your school. Expect to be impressed. And expect grandparents to be jealous that the Reading Warehouse wasn't around when they were chasing down summer reading.